This vibrant, oval-shaped serving plate is crafted using high-fired ceramic, and hand-painted over lace with a bright cobalt blue pattern in perfect contrast with the natural stoneware base. Serve your guests with an elegant artisan touch, or simply bring your living space to life with the plate’s eccentric design. Each of these small-sized serving plates is individually wheel-thrown, highly durable and food/dishwasher safe. Every single piece from Terrafirma Ceramics is a collectible, personally signed and dated by Ellen Evans. Each Terrafirma Ceramics piece is individually handcrafted so sizes are approximate. Variations in color, texture, surface blushing and other minor imperfections are to be expected and assure each piece of its individuality. 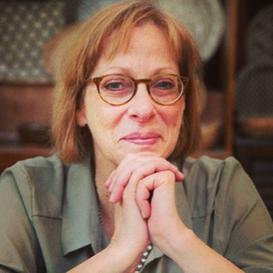 Terrafirma Ceramics founder and Artistic Director - Ellen Evans' casual, yet sophisticated style encourages creative place settings by mixing and matching complimentary colors and patterns across the various pieces on your tabletop to create a one of a kind dining experience. This platter was a gift and was well received. Added to a small collection of blue Terrafirma pieces. Shipping was quick and packing great to assure safe delivery. Will use Nicole-Rhea again when looking for another piece. Fast, attentive service. Beautiful quality and design. Wow! Incredible service! I purchased a plate made by Terrafirma Ceramaics in a little shop where I live. I wanted something like it in a larger size, but my local shop was not able to accommodate my request. I found what I wanted on the Nicole-Rhea website and took a chance on ordering it. It arrived quickly, was carefully packaged and was accompanied by a hand written thank you note for my purchase. I felt like I received more personal attention from this online order than I did in my neighborhood shop. I do not share this to say anything negative about my neighborhood shop. I love my local store and will always look there first, but my experience with Nicole-Rhea was as personal and attentive as if I was there in person. I will definitely order again from this company. It is the perfect place to look for a unique and well made gift for someone specialâ€¦or for yourself!